Pair of vases, are they antique? and approx 4.5" across each side. I was told they are probably early 1900s. but wanted to confirm this if possible. I would appreciate any help you can give me, thanks. 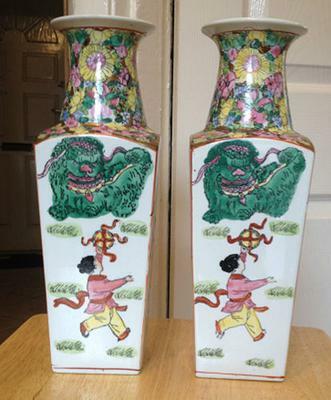 Comments for Pair of vases, are they antique? I would say 21st century. I'm afraid these are not antique. The decoration style and colors are 20th century, probably second half. Rather on the later side, I would think.